AMC's Great Kids, Great Outdoors: Hut, Hut, Hut! Such a simple sentiment, really: “Our job is to enjoy the mountains.” I know George is referring to his work in the huts. But when I read his words at the top of Heather Stephenson’s publisher’s note, I suddenly had an urge to head into the alpine zone myself. I’m at a different stage of life than George and the other hut croo, but Jim and I and the kids can still spend a day or two at the high hotels called huts that stretch roughly a day's hike apart from each other along the Appalachian Trail over the peaks of the White Mountains. I went online and realized that plenty of other people have already felt this urge. I’m not saying the huts are full . . . yet. But there are already stretches, looking at July and August, when one or another hut is full up on Saturday night, or for several days in a row even midweek. It’s a reminder to me that if we want to see George in his glory this summer, or any of the other hut croo, we’d better get going. Read "The Hut Life" and "Meet the 2010 Hutmasters" in AMC Outdoors (May/June 2010). Check availability and make reservations in all AMC huts and lodges. 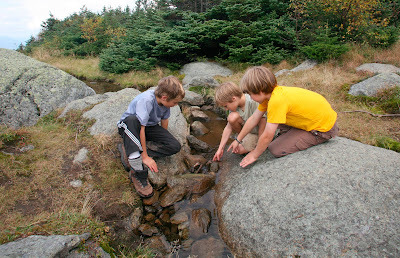 Photo credit: Kids playing near Madison Spring Hut. Herb Swanson, courtesy of AMC.